Hey there...we're getting really close now! Actually that might be an understatement considering we are at the 2 week mark, 14 days… it feels just like the gas tank that seems to empty REALLY fast when it gets to that final quarter mark. And as each day passes we are also getting more and more excited about all the fabulous goods that will be arriving here at the barn! 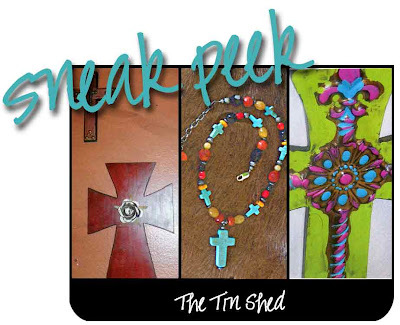 We thought you might enjoy a few more sneak peeks for yourself, and as always, send the link to family and friends!! Picture this. Creative mom. Two beautiful girls perfectly suited for modeling anything cute, fashionable, and unique. Picture them living hundreds of miles from family, in the deep South where 'old' rules. So what's this mom to do with time on her hands? She creates . . .uses vintage pillowcases and transforms them into the most adorable dresses adorned with beautiful ribbon. Whether worn as a dress for a baby or a blouse for a 6 year old, they will certainly get compliments. My daughter has worn several of them over the past few years, and the dresses always attract attention. They are beautiful and unique, and they wear well since they have already stood the test of time! The pillowcase dresses are perfect for the South, but then WillaBelle relocated to Michigan. Goodbye balmy days, hello COLD days! So once again, she creates. The need for a warm covering on brisk days inspired her to design stylish ponchos. Don't think plastic and rain. Think rich, woolly, and darling! Her color combos are amazing and the hand-crafted details are worth every penny. And if the vintage pillowcase dresses or ponchos aren’t on your list, then the hand dyed scarves just might do the trick! With a detail of shades of dye- these are gorgeous, sure to compliment many outfits! And you can be certain you will have a one of a kind accessory. WillaBelle will impress you! The gals from The Tin Shed came to the Barn Sale last year as eager shoppers. This year they come as happy vendors! Their cute little store in Yoakum, Texas is going to be transformed to a booth here in the barnyard! 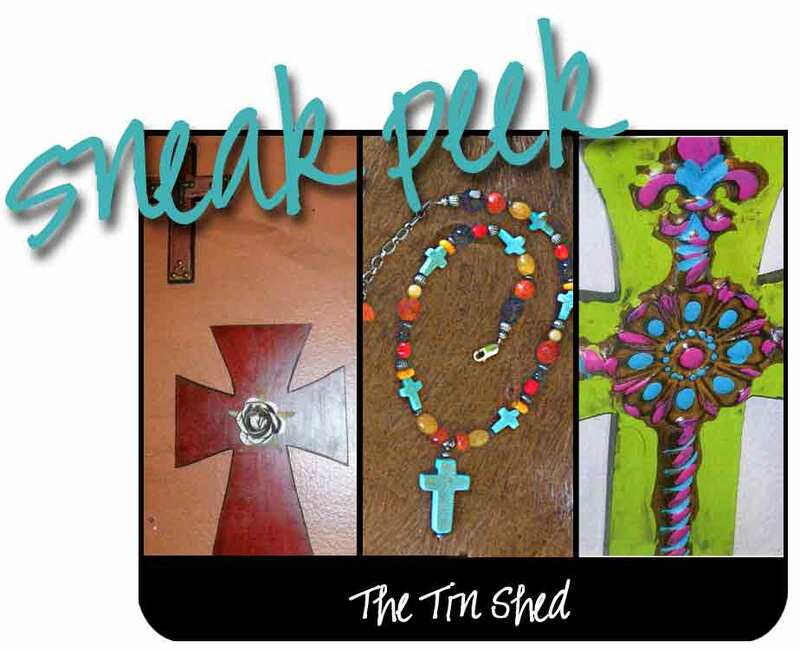 The Tin Shed proudly displays their hand-crafted crosses and jewelry and boot jacks. Yes, Boot Jacks! We are so excited about them. Can’t wait…what a great gift for the guy on your list- or the gal like me that loves to wear boots!! Walk into their booth in two weeks, and you'll be greeted with bright colors and happy smiles! Yep. Just two weeks. November 13th. I love Willa Belle - I am here in Michigan, I've bought several items from Jennifer. Do you know if she has a website? I can't find the card I took from her & she wasn't at the same craft show last year in Paw Paw.